The division between body and mind is first healed with the breath. Pranayamas are ancient yogic breathing techniques, which link the body with the mind. They take our yoga practice beyond the physical aspect to the next level of awareness. Yoga Chikitsa, the Primary Series of Ashtanga Yoga is cleansing, balancing and healing. Nadi Shodana, the Intermediate Series is said to purify the subtle channels, gradually giving access to the central channel, described in Tantric texts as an empty vessel, a flute played by Krishna. When the energy flows undisturbed through the central channel, the mind settles into the breath and they become one. In this intensive, Kia will guide us through traditional Kriyas (purification techniques), Pranayama practices, and take us on an explorative journey of the Primary and Intermediate Series of Ashtanga Yoga. We will approach these transformational practices with intelligence and awareness of both physical and energetic alignment principles, enabling you to inform and inspire your practice and understanding of yoga as a whole. 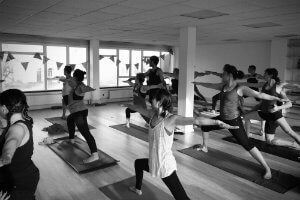 Kia’s weekend workshop is CPD approved for teachers by YOGA ALLIANCE UK. Please note: You do not need to be an Intermediate Series practitioner to attend. The workshop is open for all interested practitioners, except complete beginners to Ashtanga Yoga. Coming together as One in body, breath and mind through the beauty and flow of a traditionally Sanskrit counted Primary Series. Guruji always said Ashtanga Yoga is for the mind. When we focus on counting the mala of the postures, the practice becomes the object of meditation for the student and the teacher – creating one single intention. Some previous experience of Ashtanga Yoga is advised to join this class. Pranayamas are ancient yogic breathing techniques which link the body with the mind. They take our yoga practice beyond the simply physical aspect to the next level of awareness. Introduction to Pranayama and Kriyas and its philospohy for new students. Refining and cultivating your practice and understanding for those with more experience. You will build up a self practice of Pranayama to continue after the workshop, and deepen your appreciation for the significance of the breath in yogic practices and philosophy. Yoga Chikitsa, the Primary Series, is the foundation for all other series of Ashtanga Yoga. Chikitsa means therapy. This essential sequence is purifying, healing and balancing on every level of our being – body, breath and mind. We will journey through the mala of postures with an explorative mindset. Looking at common energetic principles, actions, alignment details & adjustments. See Friday evening for description. This transformational sequence is known to balance the energy, gradually giving access to the central channel, Sushumna Nadi. It combines deep back-bending, twisting, hip-opening and balancing postures and is designed to awaken and strengthen our entire body and nervous system. We approach these challenging postures with intelligence, playfulness and awareness of both physical and energetic alignment principles. 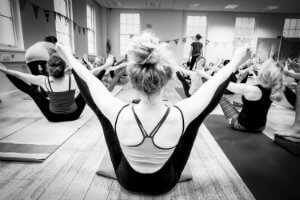 Kia will take you on a journey beyond the external form of the postures towards internal understanding of energetic balance – enabling you to inform and inspire your practice regardless of your current level.